(Marlton, NJ – September 2015) Technical Help in Engineering and Marketing (T.H.E.M. ), a leading North American provider of single-serve flexible packaging solutions, will demonstrate the Sanko model FR-3, a 12-lane pouch filling machine at Pack Expo 2015, Booth S-7472, September 28-30, Las Vegas Convention Center, Las Vegas, NV. Capable of operating at fill speeds of over 230 cycles per-minute, the FR-3 is the fastest liquid pouch machine in its class worldwide. Technical Help in Engineering and Marketing (T.H.E.M. ), a leading North American provider of single-serve flexible packaging solutions, will be showcasing the Sanko FR-3 Pouch Filler at Pack Expo 2013, September 23-25, Booth S-5764, Las Vegas, NV. 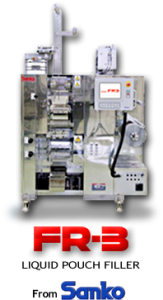 Capable of filling over 300 cycles-per-minute, the FR-3 is the fastest pouch filling machine in its category worldwide. With over 500 systems currently operational, the FR-3 has been a central part of Sanko’s packaging machinery portfolio for many years. As the exclusive representative for Sanko packaging machinery in North America, T.H.E.M. is now offering the FR-3 to a broader base of North American consumer packaged goods companies.